Tiny Toon Adventures is a side-scrolling platform game that features many characters from the animated TV series. There's a total of six worlds (with three levels each) and you'll travel to locations such as The Hills and Downtown before facing Montana Max in his mansion. 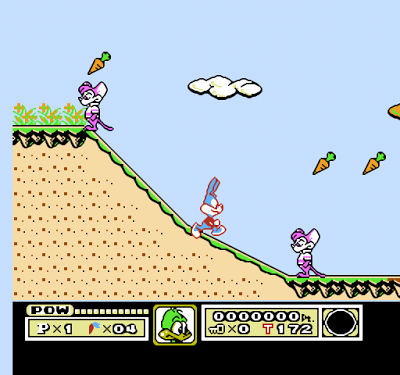 You play as Buster Bunny and before each world you can choose an alternate character to tag along with you; these are Dizzy Devil (spin attack), Furrball (climbs on walls) and Plucky Duck (can fly short distances). This is a great idea but you can only play as them by collecting a Star Ball somewhere in the level, i.e. no switching on the fly. These extra characters are fun but unfortunately the level designs don't really cater for their unique talents. Plucky Duck also has an awful green sprite which jars with the rest of the nicely detailed characters! Despite this, the game is still extremely polished and comparisons to Super Mario Bros. 3 (1988, NES) immediately spring to mind due to the graphics, jump and slide mechanics. Thankfully the controls are very responsive as it's a much more challenging game than I was expecting. There's quite a bit of trial and error required to complete certain areas and at times you'll need to rely on muscle memory to get you through the tricky spots. Most of the levels are your standard platforming fare but there is a bit of variety including areas where you have to hunt down Gogo Dodo items to proceed and parts where you have to avoid Elmyra or face being sent back to the start of the world! The music is excellent including a great rendition of the main theme. The animation is also superb and I love the way Buster rests his arm down when he's near a wall! Tiny Toon Adventures isn't anything you haven't seen before but everything it aims to achieve is done well. Don't be fooled by its cutesy graphics as this is one game that will provide a decent challenge to platform veterans! Random trivia: If the number of carrots you collect in a level is a multiple of eleven you'll face a secret parody boss called...Duck Vader!